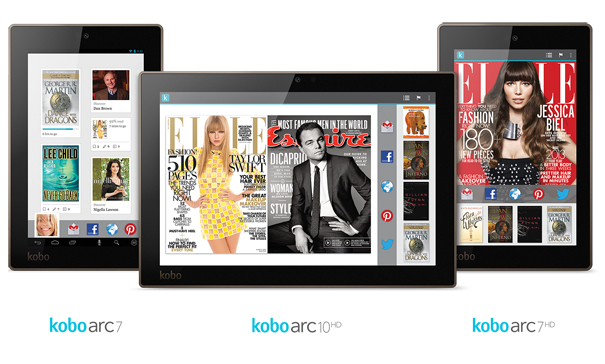 The e-reading company Kobo is all set to hit the market with its latest 7-inch and 10-inch Arc tablets. It was announced in an event in New York earlier this week. It has also decided to form a partnership with read-it-later service Pocket and plans to launch a children’s digital bookstore and a digital newsstand but the end of this year. The elegant tablet is named Kobo Arc HD and is available in 7-inch and 10-inch versions. It has a feature called the “Reading Mode,” which can turn off notifications, sound and email at your convenience. An optimized lighting experience is also designed to save battery life. The features in the 10-inch version will include 16 GB of storage space, NVIDIA Tegra 4 1.8GHz quad-core processor and 2 GB of RAM. Its screen has 2560×1600 HD display, front-facing camera for video calling and WiFi connectivity. Battery life is 9.5 hours. Price is mentioned as $399. The 7-inch version is priced at $199.99 for 16 GB of storage and $249.99 for 32 GB of storage. Other feature includes NVIDIA Tegra 1.7GHz quad-core processor, 1 GB of RAM, 1900×1200 display, front-facing camera and battery back up of 8 long hours. The tablets are estimated to be out for sale this October.